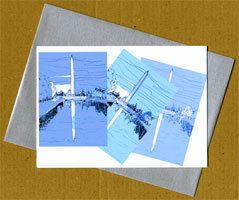 The Washington Monument twirls in cool blues on this wintry holiday card. Inside, the greeting reads "Wishing you a remarkably Happy New Year" in Liz's handwriting. You also have the option of choosing one of nine other greetings (pdf 329k) to make the card just right for you. The back of the card features a quote from George Washington: "Observe good faith and justice towards all nations; cultivate peace and harmony with all." This 6 1/4 x 4 1/2 card is printed on bright white recycled card stock and comes with an icy silver envelope. Sets of 8 cards are packaged in a kraft box with clear lid.